Ameland (Dutch pronunciation: [ˈaːməlɑnt] ( listen ); West Frisian: It Amelân) is a municipality and one of the West Frisian Islands off the north coast of the Netherlands. It consists mostly of sand dunes. It is the third major island of the West Frisians. It neighbours islands Terschelling to the west and Schiermonnikoog to the east. This includes the small Engelsmanplaat and Rif islands to the east. West Frisian, or simply Frisian is a West Germanic language spoken mostly in the province of Friesland in the north of the Netherlands, mostly by those of Frisian ancestry. It is the most widely spoken of the three Frisian languages. The West Frisian Islands are a chain of islands in the North Sea off the Dutch coast, along the edge of the Wadden Sea. They continue further east as the German East Frisian Islands and are part of the Frisian Islands. Ameland is, counted from the west, the fourth inhabited Dutch Wadden island and belongs to the Friesland/Fryslan province. The whole island falls under one municipality, which carries the same name. The Wadden islands form the border between the North Sea and the Wadden Sea, which lies on the south side of the island file. The municipality of Ameland had a population of 3,683 in 2017. The inhabitants are called Amelanders. Friesland, also historically known as Frisia, is a province of the Netherlands located in the northern part of the country. It is situated west of Groningen, northwest of Drenthe and Overijssel, north of Flevoland, northeast of North Holland, and south of the Wadden Sea. In 2015, the province had a population of 646,092 and a total area of 5,100 km2 (2,000 sq mi). The North Sea is a marginal sea of the Atlantic Ocean located between the United Kingdom, Denmark, Norway, Sweden, Germany, the Netherlands, Belgium and France. 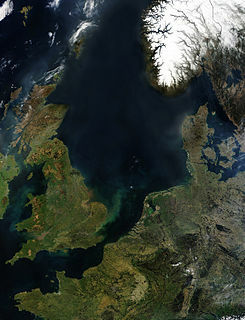 An epeiric sea on the European continental shelf, it connects to the ocean through the English Channel in the south and the Norwegian Sea in the north. It is more than 456 kilometres (283 mi) long and 124 kilometres (77 mi) wide, with an area of around 53,910 square kilometres (20,810 sq mi). The Wadden Sea is an intertidal zone in the southeastern part of the North Sea. It lies between the coast of northwestern continental Europe and the range of low-lying Frisian Islands, forming a shallow body of water with tidal flats and wetlands. It has a high biological diversity and is an important area for both breeding and migrating birds. In 2009, the Dutch and German parts of the Wadden Sea were inscribed on UNESCO's World Heritage List and the Danish part was added in June 2014. The island has four villages, and one small part-village. Hollum is the largest village on Ameland, Netherlands, one of the West Frisian Islands. It is situated on the westernmost part of the island and had, as of January 2017, a population of 1,165. The Ameland Lighthouse, commonly known as Bornrif, is a lighthouse on the Dutch island Ameland, one of the Frisian Islands, on the edge of the North Sea. It was built in 1880 by order of William III of the Netherlands. It was designed by Dutch lighthouse architect Quirinus Harder and built by the foundry Nering Bögel in Deventer. The individual segments were shipped to Ameland and welded together on-site. Ballum is a village on the western half of the island of Ameland and the smallest of the total of four villages on the island, one of the West Frisian Islands and part of the Netherlands. It has a population of about 350; this excludes about 75 inhabitants of the countryside surrounding the village. First mentioned as Ambla in the eighth century, it paid tribute to the county of Holland until in 1424 its lord, Ritske Jelmera, declared it a "free lordship" (vrijheerschap). A tribute (/ˈtrɪbjuːt/) is wealth, often in kind, that a party gives to another as a sign of respect or, as was often the case in historical contexts, of submission or allegiance. Various ancient states exacted tribute from the rulers of land which the state conquered or otherwise threatened to conquer. In case of alliances, lesser parties may pay tribute to more powerful parties as a sign of allegiance and often in order to finance projects that would benefit both parties. To be called "tribute" a recognition by the payer of political submission to the payee is normally required; the large sums, essentially protection money, paid by the later Roman and Byzantine Empires to barbarian peoples to prevent them attacking imperial territory, would not usually be termed "tribute" as the Empire accepted no inferior political position. Payments by a superior political entity to an inferior one, made for various purposes, are described by terms including "subsidy". Holland is a region and former province on the western coast of the Netherlands. The name Holland is also frequently used informally to refer to the whole of the country of the Netherlands. This usage is commonly accepted in other countries, and sometimes employed by the Dutch themselves. However, some in the Netherlands, particularly those from regions outside Holland, may find it undesirable or misrepresentative to use the term for the whole country. Lord is an appellation for a person or deity who has authority, control, or power over others acting like a master, a chief, or a ruler. The appellation can also denote certain persons who hold a title of the peerage in the United Kingdom, or are entitled to courtesy titles. The collective "Lords" can refer to a group or body of peers. Although Holland, Friesland and the Holy Roman Emperor contested this quasi-independent status, it remained a free lordship until the ruling family, Cammingha, died out in 1708. After that, the Frisian stadtholder John William Friso, Prince of Orange, became lord of Ameland and after him, his son the stadtholder of all the Netherlands, William IV, Prince of Orange, and his grandson, William V, Prince of Orange. 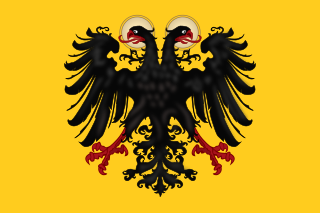 The Holy Roman Empire was a multi-ethnic complex of territories in Western and Central Europe that developed during the Early Middle Ages and continued until its dissolution in 1806 during the Napoleonic Wars. The largest territory of the empire after 962 was the Kingdom of Germany, though it also came to include the neighboring Kingdom of Bohemia, the Kingdom of Burgundy, the Kingdom of Italy, and numerous other territories. Van Cammingha is an old Frisian noble family and their house from the Dutch province of Friesland. The family castle in Ballum is now the location of the town hall. Only in the constitution of 1813 was the island finally integrated into the Netherlands into the province of Friesland. The monarchy of the Netherlands still maintain the title Vrijheer van Ameland today. In 1871 and 1872, a dike was built between Ameland and the mainland by a society for the reclamation of Frisian land from the sea. The dike ran from Holwerd to Buren and was 8.7 km (5 mi). long. The province and the Dutch realm each paid 200,000 guilders. In the end, it was unsuccessful; the dike did not prove to be durable and in 1882, after heavy storms in the winter, repair and maintenance of the dam were stopped. The dike can still be partially seen at low tide. The dam at Holwerd is the beginning of this dike. Like all West and East Frisian Islands, Ameland is a unique piece of nature. The profusion of different plants on the island is caused by the immense variety of landscapes. One of the scenic areas is the Oerd, a large complex of dunes which is still expanding by the year. Because of the differing landscapes and types of flora, over 60 different species of birds are sitting there every year. At the eastern part of the Oerd lies a beach plain called the Hon. Besides dunes and beaches, Ameland has some woods, like the Nesser bos ("Wood of Nes"). Most travelers reach the island by ferry from Holwerd in the mainland of Friesland, but there is also an Airport near Ballum (Ameland Airport). A bus service connects the ferries from Hollum/Ballum (route 130) and Buren/Nes (route 132). When the sea between Friesland and Ameland is low tide one can walk across (see mudflat hiking). Leeuwarden, Stadsfries: Liwwadden) is a city and municipality in Friesland in the Netherlands. It is the provincial capital and seat of the States of Friesland. The municipality has a population of 122,293.
het Bildt is a former municipality in the province of Friesland in the northern Netherlands; its capital was Sint Annaparochie. The population was 10,610 in 2017. On 1 January 2018 it merged with the municipalities of Franekeradeel, Menameradiel and parts of Littenseradiel to form the new municipality Waadhoeke. Schiermonnikoog is an island, a municipality, and a national park in the northern Netherlands. Schiermonnikoog is one of the West Frisian Islands, and is part of the province of Friesland. It is situated between the islands of Ameland and Rottumerplaat. Terschelling is a municipality and an island in the northern Netherlands, one of the West Frisian Islands. It is situated between the islands of Vlieland and Ameland. Vlieland is a municipality and island in the northern Netherlands. The municipality of Vlieland has one major town, Oost-Vlieland. It is the second most sparsely populated municipality in the Netherlands, after Schiermonnikoog. Weststellingwerf is a municipality in the province of Friesland in the northern Netherlands. It is one of the municipalities of Friesland, where the spoken language is not West Frisian; instead, Stellingwerfs, a dialect of Dutch Low Saxon, is spoken here. Texel is a municipality and an island with a population of 13,641 in the province of North Holland in the Netherlands. It is the largest and most populated island of the West Frisian Islands in the Wadden Sea. The island is situated north of Den Helder, northeast of Noorderhaaks, also known as "Razende Bol" and southwest of Vlieland. 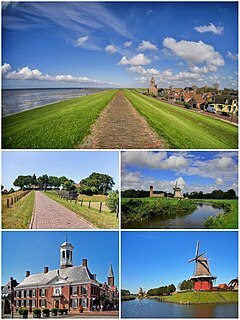 Harlingen is a municipality and a city in the northern Netherlands, in the province of Friesland on the coast of Wadden Sea. Harlingen is a town with a long history of fishing and shipping. Harlingen received city rights in 1234. The Frisian Islands, also known as the Wadden Islands or the Wadden Sea Islands, form an archipelago at the eastern edge of the North Sea in northwestern Europe, stretching from the northwest of the Netherlands through Germany to the west of Denmark. The islands shield the mudflat region of the Wadden Sea from the North Sea. Nes is the second largest village on the island of Ameland, one of the West Frisian Islands in the northern Netherlands. Buren is the easternmost village on the island of Ameland, one of the West Frisian Islands and part of the Netherlands. Buren had, as of January 2017, a population of 715. Mudflat hiking is a recreation enjoyed by Dutch, Germans, Danes, and others in the Netherlands, northwest Germany and in Denmark. Mudflat hikers are people who, with the aid of a tide table, use a period of low water to walk and wade on the watershed of the mudflats, especially from the Frisian mainland coast to the Frisian islands. Holwerd is a village in Noardeast-Fryslân municipality in the northern Netherlands, in the province of Friesland. It had a population of around 1,607 in January 2017. Before 2019, the village was part of the Dongeradeel municipality. Waadhoeke is a municipality of Friesland in the northern Netherlands. It was established 1 January 2018 and consists of the former municipalities of Franekeradeel, het Bildt, Menameradiel and parts of Littenseradiel, all four of which were dissolved on the same day. Lauwersoog is a seaside village in the province of Groningen, located in the northern part of the Netherlands. It is part of the municipality of the Marne. It had a population of 140 in 2017. Noardeast-Fryslân is a municipality of Friesland in the northern Netherlands. It was established 1 January 2019 and consists of the former municipalities of Dongeradeel, Ferwerderadiel and Kollumerland en Nieuwkruisland, all three of which dissolved on the same day. ↑ "College van B&W" [Board of mayor and aldermen] (in Dutch). Gemeente Ameland. Archived from the original on 2013-09-08. Retrieved 7 September 2013. ↑ "Postcodetool for 9163HD". Actueel Hoogtebestand Nederland (in Dutch). Het Waterschapshuis. Archived from the original on 21 September 2013. Retrieved 7 September 2013. ↑ "Duinen Ameland". Ramsar Sites Information Service. Retrieved 25 April 2018. ↑ "Burgemeester Waldaschool". BWS Ameland. Wikimedia Commons has media related to Ameland .